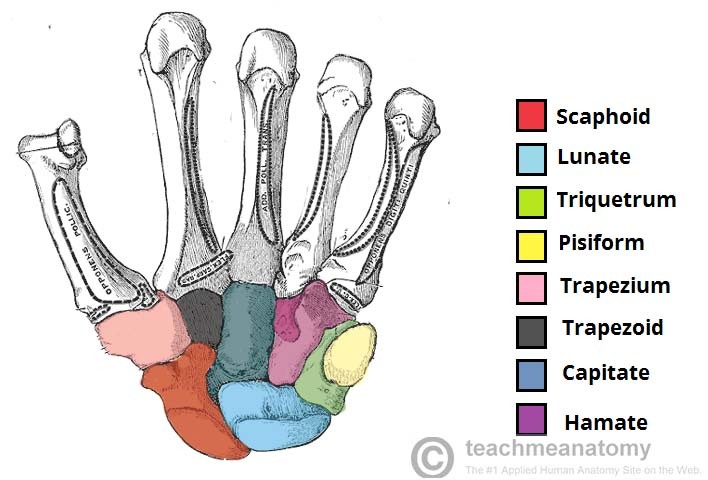 The scaphoid is ‘boat’-shaped* bone and is the most common carpus to be fractured. Scaphoid fractures are most common in men aged 20-30 years, with about 10% presenting with an associated fracture. The scaphoid is anatomically divided into three parts: the proximal pole, waist, and distal pole. It is important to appreciate the blood supply to the scaphoid (Fig. 2), which is supplied by branches of the radial artery. The dorsal branch of the radial artery, which supplies 80% of the blood, enters in the distal pole and travels in a retrograde fashion towards the proximal pole. Consequently, fractures can compromise the blood supply, leading to avascular necrosis (AVN) and subsequent degenerative wrist disease. The scaphoid is fractured following trauma, which is often high energy. Patients will complain of sudden onset wrist pain and bruising may be present. There is tenderness in the floor of the anatomical snuffbox, pain on palpating the scaphoid tubercle, and pain on telescoping of the ipsilateral thumb. The anatomical snuffbox (also termed the radial fossa) is a triangular depression found on the lateral aspect of the dorsum of the hand, located at the level of the carpal bones. 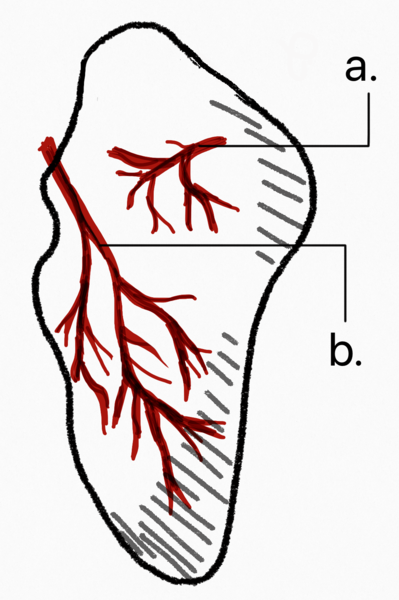 The anatomical snuffbox is defined medially by the abductor pollicis longus and extensor pollicis brevis tendons, and laterally by the extensor pollicis longus tendon. The contents of the snuffbox includes the radial artery, superficial radial nerve, and the cephalic vein. The floor of the snuffbox is made of the scaphoid, along with the trapezium, hence tenderness in this area can indicate a scaphoid fracture. The main differentials of radial wrist pain following trauma are distal radial fracture, an alternative carpal bone fracture, fracture of the base of the 1st metacarpal, or a ulnar collateral ligament injury. For suspected cases of scaphoid fracture, initial plain radiographs should be taken. A “scaphoid series” should be requested, including anteroposterior, lateral, oblique views. Scaphoid fractures are not always detected by initial radiographs (especially undisplaced fractures); if there remains sufficient clinical suspicion, despite negative initial imaging, the patient should have the wrist immobilised in a thumb splint and repeat plain radiographs in 10-14 days for further evaluation (Fig. 3). If repeat radiographic imaging is negative, however clinical findings are still in keeping with a scaphoid fracture, an MRI scan of the wrist is indicated. This is the definitive investigation and, whilst it is awaited, the interim management. The treatment of scaphoid fractures is determined by location of the fracture and degree of the fracture. Undisplaced fractures can typically be managed with strict immobilitasion in a plaster with a thumb spica splint. However, undisplaced fractures of the proximal pole have a high risk of AVN and surgical treatment may be advocated. All displaced fractures should be fixed operatively. The most common operative technique is using a percutaneous variable-pitched screw, which can be placed across the fracture site to compress it. Avascular necrosis is common complication of a scaphoid fracture (in around 30% of cases), with its risk increasing the more proximal the fracture. Non-union is the bone failing to heal properly, most commonly due to a poor blood supply. It is particularly common in scaphoid fractures (in around 10% of cases) that go undiagnosed or are inappropriately managed. Such cases can be managed with internal fixation and bone grafts, although the morbidity is high, even with surgical repair.